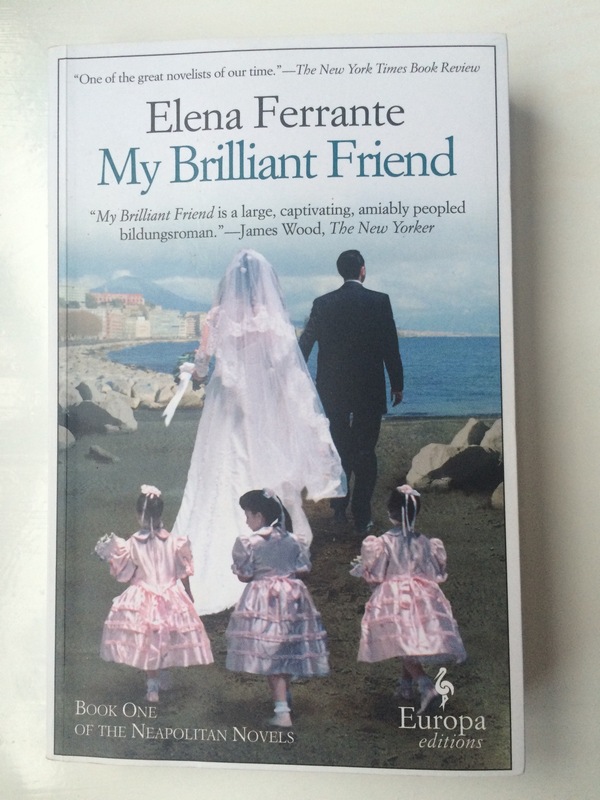 My Brilliant Friend by Elena Ferrante was another recent book club read and was suggested by the owner of the bookshop that hosts our book club. Apparently, it had been well received at another book club. Unfortunately, our book group was not so kind, I’m afraid. The book generally did not go down very well at all! One of the most interesting facts regarding this novel and its author is that Elena Ferrante is actually a pseudonym. The true author wishes to remain anonymous, despite rumours surrounding certain names that are believed to be the real novelist. My Brilliant Friend is the first book of a four part series described as the Neapolitan Novels. The story originates in Naples, Italy and despite the owner’s anonymity, the series has been a worldwide success. I found this incredible, particularly when we consider society today and its social media obsessed culture. The story revolves around the friendship between Elena and Lila, which is revealed to the reader through flashbacks from the narrative perspective of Elena. Book One introduces an elderly Elena, who receives a call from Lila’s son to say that she has disappeared. The story then returns to the past when the girls are six years old and continues until their teens. This was an interesting one for me. While I wouldn’t say that I enjoyed it particularly, I found myself intrigued by the girls’ friendship and I was compelled to keep reading. Although it was an easy read, it was clumsily translated, a point that brought about much discussion at book club. The bad translation often took me out of the story and so it became quite a distraction. Perhaps reading in its native language would have been a better experience. If only I knew more Italian and not just a few basic phrases! The style of writing irritated many in my book group and the question came up regarding how the book managed to receive so much critical praise. Its success and critical acclaim surprised us all. Is there something that we are missing? Another source of contention in the book group was the vast number of characters in the novel. 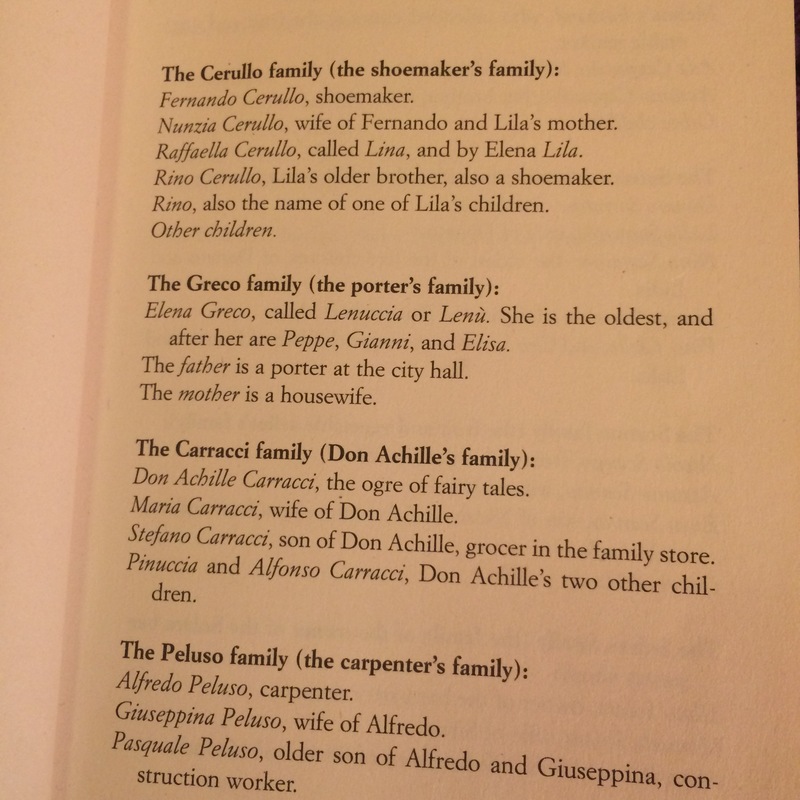 The book even provides a directory at the beginning of the novel to inform the reader of all the various families and the nicknames used for certain characters, some of whom have two or three different names. In addition to this, some character names sounded so alike that it became confusing trying to remember who was who, for example, Antonio and Alfonso. Is this merely our ignorance of a different culture or is it simply a case of too many characters? However, I did mention that I was drawn in by the central friendship, which was quite a toxic affair. Themes of jealousy, loyalty and education were demonstrated through the girls’ competitiveness. At times, it became frustrating the way that Elena was influenced by Lila, who had quite a nasty streak. Elena herself wasn’t exactly a likeable character either and this was evident in her resentment of Lila and her satisfaction whenever she was more successful than her supposed best friend. The way this carried on throughout the novel almost felt excessive and exaggerated at times and I constantly willed one of them to break the cycle. There were moments of independence which brought a welcome change to the pace of the narration, but ultimately the characters are drawn back to old habits. The novel does raise many questions about friendship. Can you ever break free from your best friend if you really want to? Do you ever wonder why you are (or still are) friends with someone? Do you have a healthy relationship with your best friend? The novel definitely brought back memories of primary and secondary school. One day you’re best friends with someone and then the next day they decide they want to be best friends with someone else and there’s no room for you anymore. Another scenario is when a new friend is brought into the mix, which often changes the friendship dynamic. This led me to question adult friendships. We change so much throughout our lifetime that the idea of remaining best friends with your childhood friend is almost a quaint notion these days, especially when people travel and move around so much now. I can actually consider myself really lucky to still be close friends with someone since we’ve been babies, which almost feels like quite a remarkable feat after over three decades! While we’ve often been separated by oceans, continents and time, our friendship has never faltered and we always pick up right where we left off as if we’ve never been a day apart. I can’t help thinking of other friendships that have been lost, not out of malice, but through a lack of contact or location and although it makes me sad, sometimes that’s just the way life happens. I do look at certain friendships around me and I find myself wondering why some people are still friends when they make each other unhappy, but female friendship can be a complex affair. If only it could be as simple as a relationship breakup, which in itself isn’t even that simple. Can you really break up with your best friend? Perhaps the direct and honest approach used in our childhood could be adapted to our adult lives? Are we capable of moving on and letting go so easily? These are just some of the questions that were raised for me when reading this novel. I was disappointed not to get more of a sense of place when reading the book, considering it was set in such a beautiful country as Italy. I did get a strong indication of the violence in Naples, though. The novel certainly explores an interesting subject, although our book group was surprised to hear that the book was being sought out by men to study female friendships. It definitely isn’t the best example to be studying! There are much more positive and inspiring books to read on the relationships between women, such as The Help, for example. There were also a couple of neat twists in the novel, which I won’t ruin. The annoying part is that it’s not a complete story and I’m not so sure that I would rush to read the other three books! Have you read all of the Neopolitan Novels collection? Have you managed to get through My Brilliant Friend? I’d love to know if the rest of the series is worth reading, so please do get in touch.